Many of you may know Kent Jarnagin - one of the owners of Cimarron River Outfitters in Kansas (our annual Kansas whitetail hunt). Kent and I have become good friends over the last 10 years and last year Kent turned a big 5-0. Kent's wife Susan reached out to me and asked me to find Kent a hunt as a surprise 50th birthday gift from his family. It had to be special and one he would not book himself. I thought a Mountain goat hunt would be just perfect for this special gift. I reached out to a number of outfitters I knew personally, ones with good track records and capable of delivering a truly memorable, wild experience for Kent. It was not an easy decision. I know some excellent goat guides. 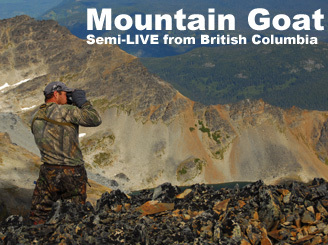 Ultimately, it was a conversation with Jack Hooper that helped me decide that Babine Guides was the perfect hunt for Kent. Their success rate was outstanding, they had lots of other game available to hunt, but above all - I really liked Jack. He was enthusiastic, honest and I immediately knew he was someone Kent would like to hunt with. I brought the details back the Susan who gave me the thumbs up. It was perfect for Kent. Then Susan told me the hunt would be extra special if I joined him. At first I dismissed the idea. I had killed two goats and I wasn't sure I was ready for the training required for such a physical hunt. After a lot of consideration, and another conversation with Jack - I was in. Kent's family delivered his special gift and our hunt was on! While Kent and I are both hunting together, I told him I was the cameraman until he got his goat - even if it took the entire trip and I never got to hunt. I was fine with that. So until Kent kills his first goat consider me the paparazzi of goat hunting. I am tagged up and will have my bow with me in the mountains. Neither Kent nor I are looking for any particular trophy. We both just want a legal, mature goat. Of course, if there is a lot to choose from we'll hold out for something special. In addition to the goat tag, Kent is carrying a moose, black bear and wolf tag. I have 2 wolf tags and will be diving for Jack's rifle if I see one. When it comes to a wolf I would use a predator drone to kill them if it were legal. So don't be surprised if you see me pick up a rifle during this hunt - but only for wolf. 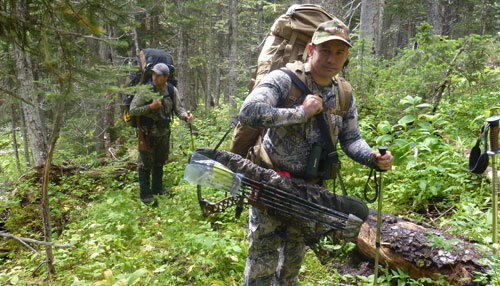 We booked extra days so we should have plenty of time for such a hard-core, mixed bag hunt. This one will be extreme. The 5-hour climb up started in the trees and slowly broke into the alpine. By dinner time we would be above treeline and in goat country. We climbed out of the trees and into a sub-alpine meadow. 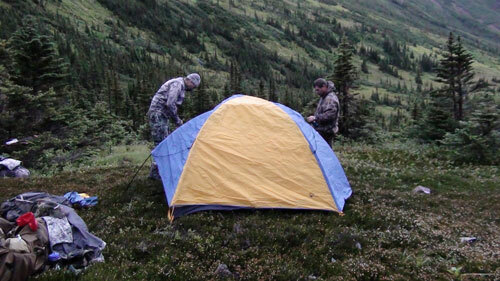 I had lots of people call me to tell me how Babine's goat hunts were "easier" than other hunts but looking up the valley I saw nothing easy about it. Still, despite the push with our packs it was simply incredible to be goat hunting again. Jack estimated the hike would take five hours and he was pretty much on the mark. I was happy to reach our little camping spot just below the cliffs. We drank some water and just started to cool down a bit before Jack spotted a goat up in the cliffs. 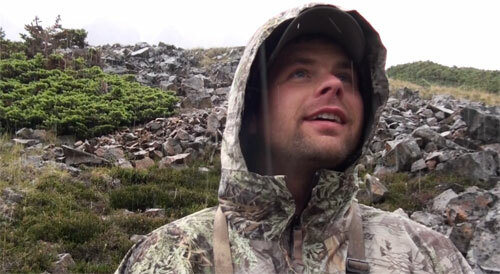 It was fantastic, it was a billy and he was about 1000 yards up the mountain but in a difficult spot. Jack told us to bring our packs since we may need to camp on him. It was at that moment that I realized we are dealing with a very energetic, and driven goat guide. That white dot in the middle of this cliff is a billy. We climbed out of the basin to see if there was a way up to him but there was no way. I wasn't sure how I felt about going after that goat. But we slugged our packs back on and headed up the steep incline after the billy. It took at least 90 minutes to get to the top of a rocky knoll which gave us a good vantage point to the goat. The skies turned dark and we were suddenly in a high mountain sleet storm. Just two hours earlier it was clear and sunny, now we were diving for our Sitka Stormfront rain gear. We sat on that goat for an hour as it began to get dark. I was mildly hypothermic, a mixture of sweaty base layers along with a cold sleet hammering us. 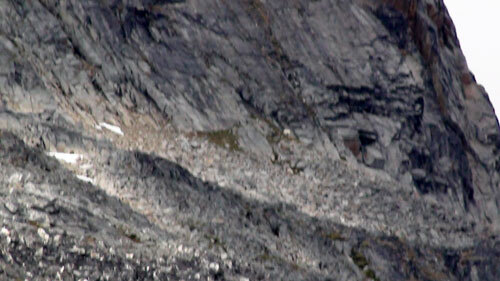 The goat was staying in the cliffs and totally unreachable. There was no camping spots up high and we didn't want to blow the goat out so we carefully picked our way back down the steep hillside to the campsite we were at earlier. On the way down, Kent slid on some rocks, snapping his walking stick in half and hyper-extending his knee - slightly. A few moments later I went down too, but no damage other than being covered with mud on my right side. I was able to throw my bow to the side just in time before I landed on it and potentially ruining my hunt before it started. Jack Hooper was always smiling - despite the fact that we had hiked several exhausting miles up a steep mountain and were now in a sleet storm with a tough climb down ahead of us. Wet, exhausted and ready for bed, we quickly made camp in the cold rain and climbed into our sleeping bags. We set up our little alpine tent and had a quick meal before a good night sleep. Tomorrow will likely be harder than today was. Nothing about this hunt was going to be easy. But I wouldn't want to be anywhere else. Goat hunts are special. You hate them while you are doing them, but the minute you climb down you NEED to head back. There is just something about it that is unlike any other hunt I have done. Kent just got his first taste of it too. This Alpine Bowhunting Adventure is sponsored by these fine companies..